That does it: if I ever run for office again and win, I'm going to give my acceptance speech in High-Elvish Sindarin! Indian Trail is a nice town near Charlotte here in North Carolina. And one of its city councilmmembers - one David Waddell - had decided that "enough was enough" about the way the officials of Indian Trail were handling what he considers to be development run amok, among other things. Exasperated by it all, David Waddell decided to resign his seat. Except that he did it using the Klingon language: the tongue spoken by the proud warrior race from the Star Trek franchise. 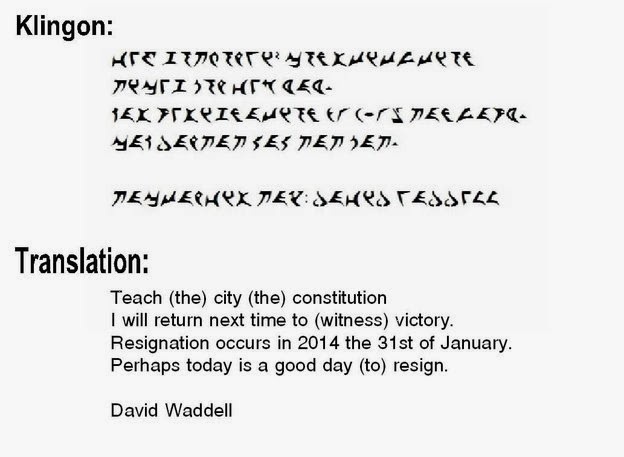 An Indian Trail councilman decided to boldly go where no politician has gone before – and tendered his resignation this week in the Klingon language. Apparently David Waddell no longer wanted to live long and prosper on the board. In an interview Thursday, Waddell said his resignation letter to Mayor Michael Alvarez was written in Klingon, the language of a proud warrior race in the “Star Trek” TV shows and movies, as an inside joke. But in case the mayor wasn’t up to speed with his Klingon, Waddell included a translation using Bing.com. “Folks don’t know what to think of me half the time,” said Waddell, so “I might as well have one last laugh” on the board. "Perhaps today is a good day to resign"! Good play, David. 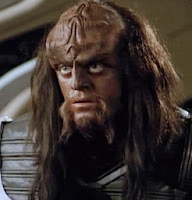 You may have left a Klingon, but it sure sounds like you tried to bring the logical mind of a Vulcan to city politics. May you live long and prosper!